In 2D cases, this boundary condition should be assigned to boundaries which are normal to the reduced coordinate. It applies an empty condition on such boundaries to indicate a two-dimensional problem. 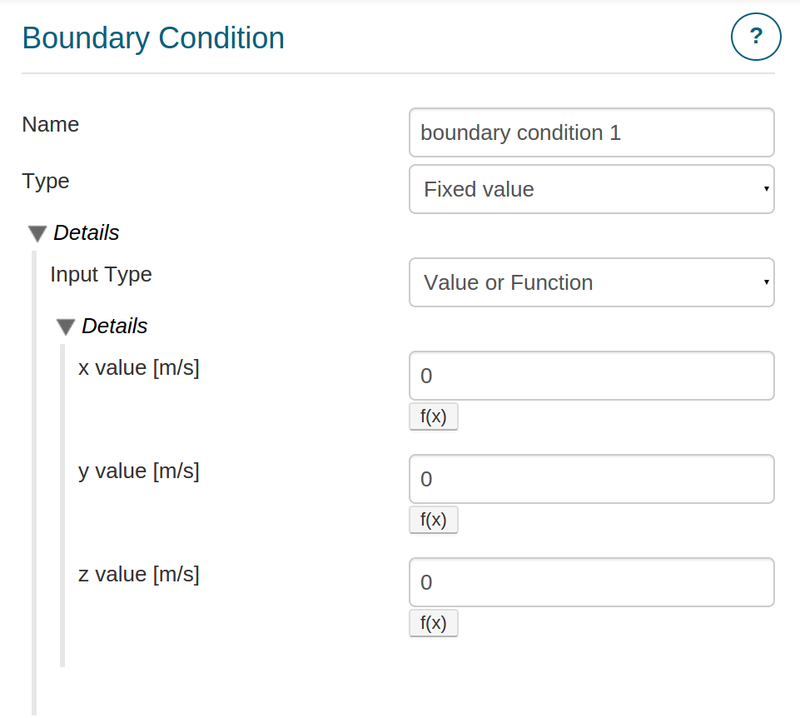 This boundary condition is used when no condition at the boundary needs to be set. 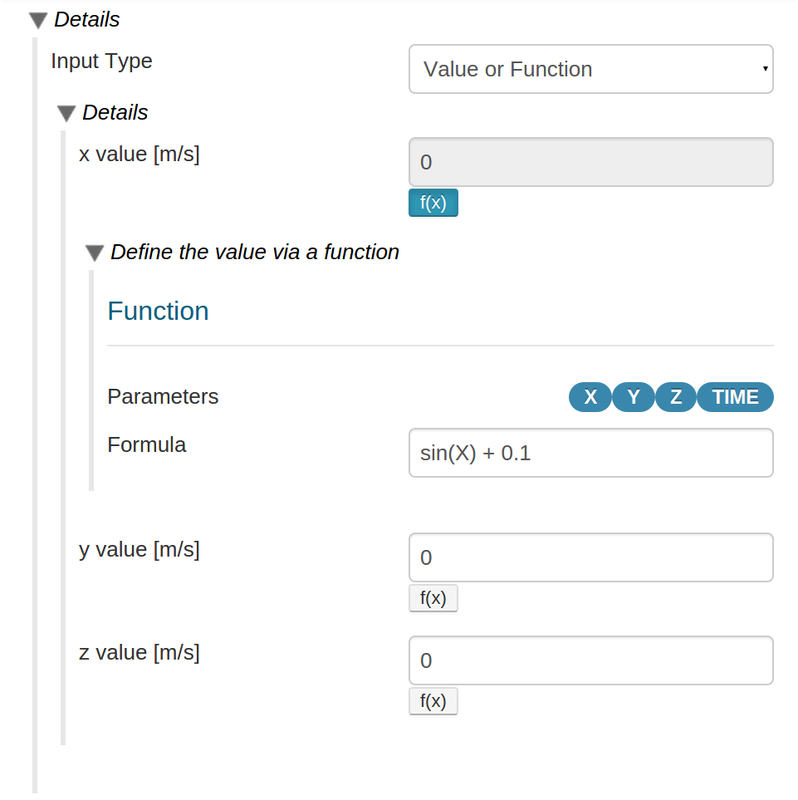 It is assumed that the value is calculated and assigned when the field is computed. This boundary condition provides cyclic conditions between two boundaries. For example, it could be used in systems with transitional periodicity. This boundary condition applies a prescribed gradient value at the boundary. Depending on the variable, it requires a scalar or vector value to be provided as input. The value at the boundary is then calculated using the fixed gradient and internal field values. The flow velocity is normally set to a known value. At walls, the velocity is usually set to 0. Also, turbulent quantities such as turbulent kinetic energy and dissipation rate can be set to fixed values which have to be estimated first. The pressure is often set to a known value on outlets. In incompressible simulations, it is common to use a value of 0 for the Gauge pressure. Temperature or heat transfer rate are often set to known values. An example of a fixed value boundary condition for OPENFOAM® simulations where the flow velocity is set to zero. The x value of the vector quantity is defined as a function of space coordinate X.
Alternatively, it is possible to set boundary values by uploading a CSV file. For this purpose, the user should choose File Upload as the Input Type. Correct dependencies should be chosen. In this case, the uploaded file contains values that are dependent on X, Y, and Z. 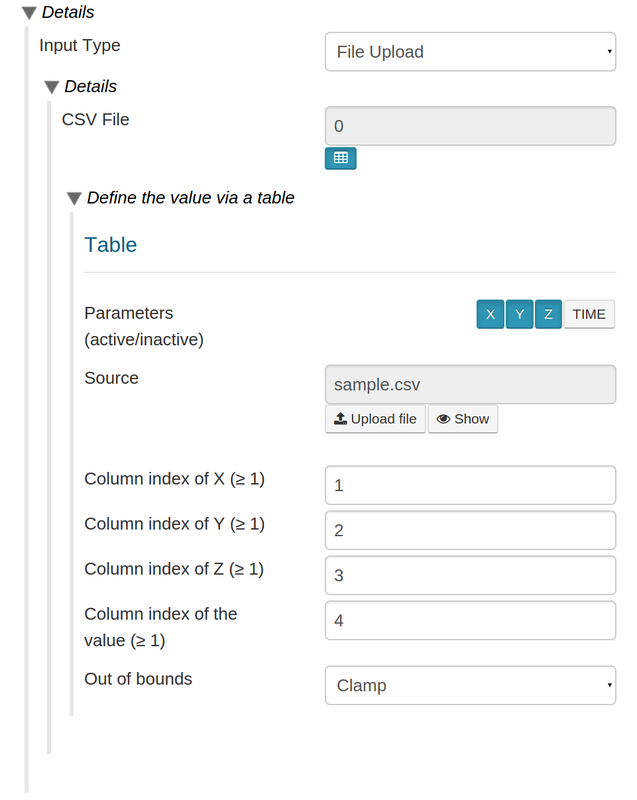 The Column index of the value identifies the column number of value in the CSV file. For vector quantities, it is assumed that this value points to the first column (the rest of the columns are placed exactly after this column). Inlet-outlet is a generic outflow condition based on the flux: if flux points out of domain, Inlet-outlet applies a zero gradient condition at the boundary. Otherwise, i.e. flux into of domain, it applies the value prescribed as use input. Depending on the variable, this value could be scalar or vector. Outlet-inlet is a generic inflow condition based on the flux: if flux points out of domain, it applies the value prescribed as user input at the boundary. Otherwise, i.e. flux into of domain, it applies a zero gradient condition. Depending on the variable, this value could be scalar or vector. This boundary condition applies a zero gradient condition at the boundary using the internal cells. It is a special case of the fixed gradient boundary condition. Typical use cases include, velocity outlets (and other transport quantities, such as turbulent kinetic energy and dissipation rate), walls (pressure gradient is often set to 0), and adiabatic walls (zero gradient for temperature). This boundary condition is used to specify domain symmetry. It is used to reduce computational effort by replacing symmetric redundancies in the interior. This boundary condition is a special case of Symmetry boundary condition in that it is could be assigned to planes only. This boundary condition provides wall condition for turbulent variables. It captures viscous effects near walls without using an overly fine mesh. Furthermore, it is possible to activate wall roughness when setting wall function boundary condition for turbulent kinetic energy. This boundary condition operates in the same way as the Cyclic boundary condition. The difference is that is is applied to two-dimensional geometries. This offering is not approved or endorsed by OpenCFD Limited, producer and distributor of the OpenFOAM software and owner of the OPENFOAM® and OpenCFD® trade marks. OPENFOAM® is a registered trade mark of OpenCFD Limited, producer and distributor of the OpenFOAM software.